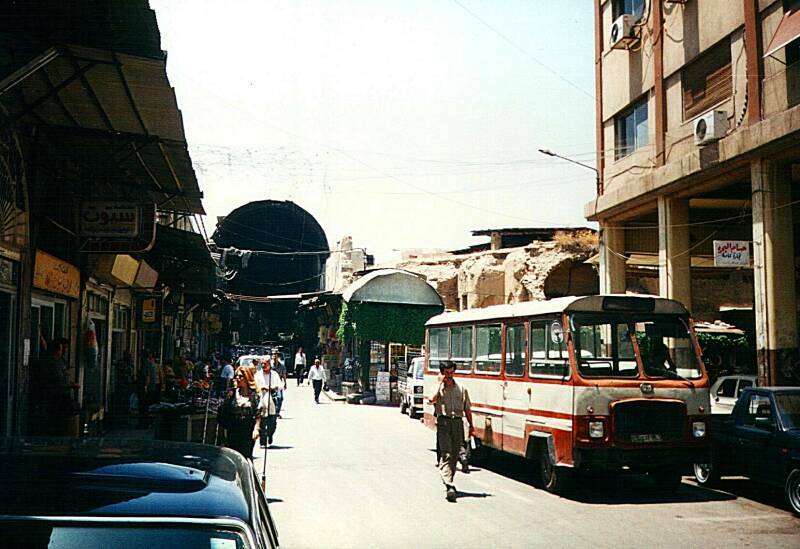 Damascus is a fascinating place to see. It's an ancient city, from before there was history. It is the oldest continually inhabited city in the world. Excavations in a tell or settlement mound on the edge of the city show that it has been inhabited since between 10,000 to 8,000 BC. 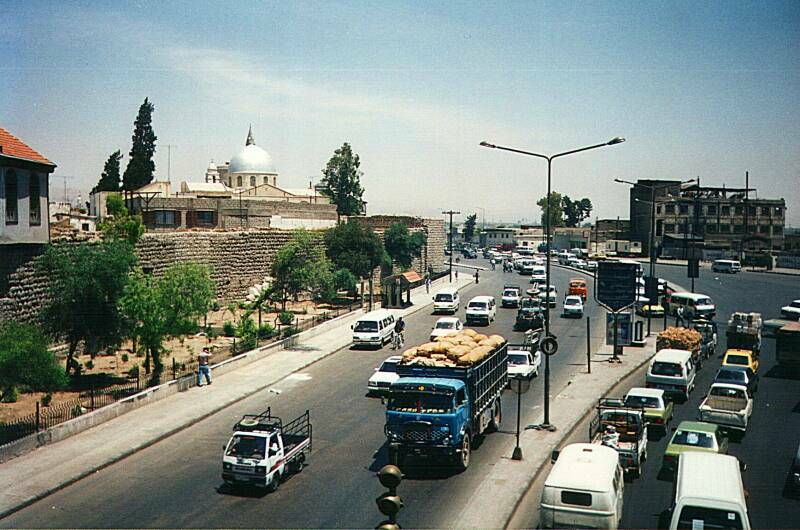 Jericho and Babylon were settled earlier, but Damascus is the oldest city still occupied. Nicolaus of Damascus, in the fourth book of his History, says thus: "Abraham ruled at Damascus, being a foreigner, who came with an army out of the land above Babylon, called the land of the Chaldeans. But, after a long time, he got him up, and removed from that country also, with his people, and went into the land then called the land of Canaan, but now the land of Judea, and this when his posterity were become a multitude; as to which posterity of his, we relate their history in another work. Now the name of Abraham is even still famous in the country of Damascus; and there is shown a village named for him." Damascus was in the Hyskos Kingdom 1720-1570 BC. The Amarna Letters, some of the earliest Egyptian records, from 1350 BC, report that Dimasqu was ruled by King Biryawaza. By 1100 it was the capital of the powerful Aramaean state Aram Damascus. Tiglath-Pileser III captured and destroyed Damascus in 732 BC. It fell to Nebuchadrezzar II and was absorbed into the Neo-Babylonian Empire in 572 BC. Then the Persians under Cyrus the Great captured the city in 538 BC and made it the capital of the Persian province of Syria. Alexander the Great swept through in the 330s BC, and after his death in 323 it was fought over by the Seleucid and Ptolemaic portions of his divided empire. It was generally Greek until the Roman general Pompey annexed it in 64 BC. Damascus became part of the Δεκαπολις or Dekapolis, the "Ten Cities", the Romans once again just taking over a Greek system and even keeping the Greek names. Traffic goes around Ash Shuhada or Martyrs' Square at the center of Damascus. In Arabic the city is called Dimashq, and sometimes it's called ash-Shām. For great meals, go to the Al-Arabi just southeast of this square toward the covered bazaar. Inner ring road around the Old City parallel to the walls. The dome is one of the Christian churches of the Eastern Orthodox district around Bab Tuma, or Gate of (Saint) Thomas. Saul of Tarsus had his "road to Damascus moment" on, well, the road to Damascus in the 30s AD. He had a vision, a θεοφάνεια or theophany actually, lost his sight for a while, converted to Christianity, and came to be known as the Apostle Paul. More on that below. The pictures above and below show the modern road paralleling the Roman-era wall around the Old City. A view the opposite direction along the inner ring road and old city wall. Maybe the site of Saul's hastily rigged elevator. Here is the fortified part of the old city wall believed to be where the apostle Paul was lowered in a basket, to escape his angry former colleagues. Saul's power increased steadily, and he was able to throw the Jewish colony at Damascus into complete confusion by the way he demonstrated that Jesus was the Christ. Some time passed, and the Jews worked out a plot to kill him, but news of it reached Saul. They were keeping watch at the gates day and night in order to kill him, but the disciples took him by night and let him down the wall, lowering him in a basket. Damascus is the most multi-cultural place I've been. Walking down the street or through the bazaar you see a mix of Bedouin just in from the desert; urban dwellers; Yemeni and Somali supermodel women in brightly colored robes; and Christian monks in coarse brown robes and sandals. 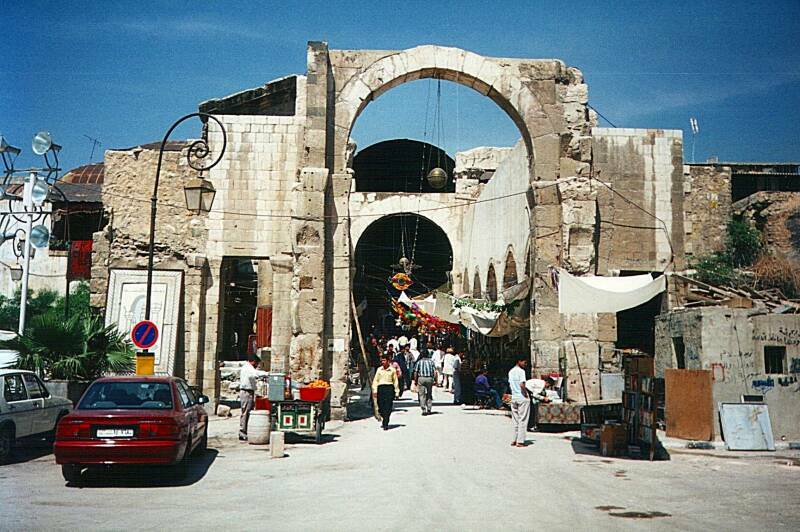 The Jupiter Gate forms the east end of the covered bazaar. It's named for the Temple of Jupiter that stood there in Roman times. 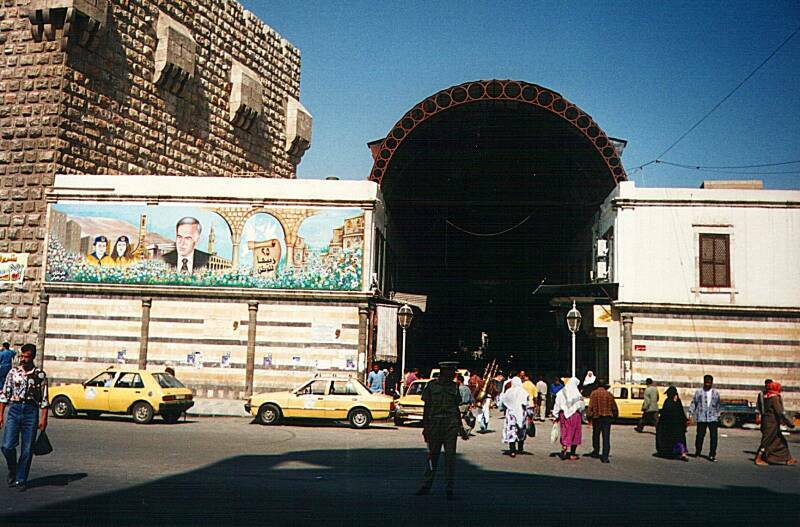 Jupiter Gate and east entrance to al-Hamidiyah Souq. West entrance to al-Hamidiyah Souq. Interior of the covered bazaar. 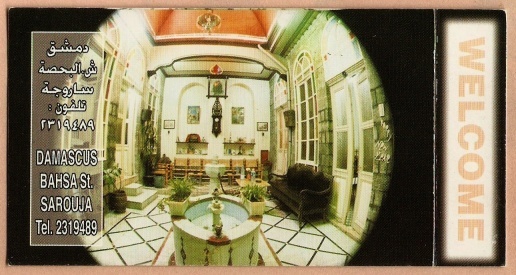 Scan of a postcard. Above is the western entrance to al-Hamidiyah Souq, the covered bazaar, and a view down its center. Getting back to the history, forces of the Rashidum Caliphate led by Khalid ibn al-Walid captured Damascus in 634 AD. Damascus reached the height of its power as the capital of the Umayyad Caliphate from 661 to 750. The Umayyad Caliphate extended from Spain in the west to India in the east. The Umayyads fell and the Abbasid Caliphate was established in 750. 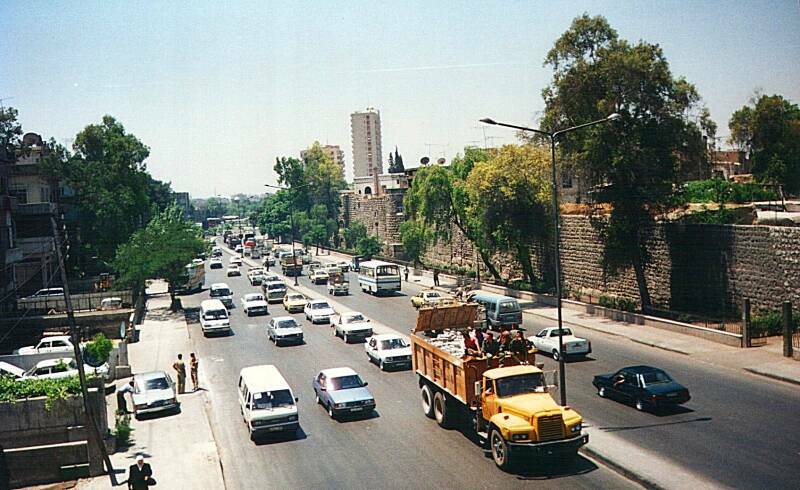 Damascus was then ruled from Baghdad. Then, in 970, the Fatimid Caliphate in Cairo gained control over Damascus. Then the Seljuk Turks arrived from central Asia. 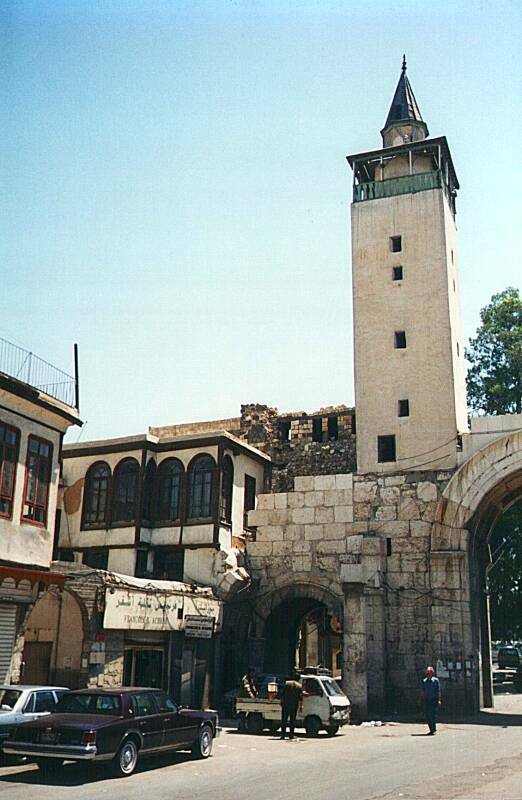 Damascus was ruled as a Seljuk dynasty from 1079 to 1104, and then by the Turkish Burid Emirs. Then the Crusades, Salah-ad-din or Saladin, and the Ayyubids. And then it was 1260 and the Mongols arrived. They were defeated and driven back, and Damascus became a provincial capital of the Mamluk Empire based in Egypt. That lasted until 1516, with a gruesome interlude in 1400 when Tamurlane sacked the city. He enslaved much of the population, removed most of the artisans to his central Asian capital of Samarkand, and killed enough of the rest of the population that a city square outside the old city wall is still called Burj al-Ru'us or The Tower of Heads. The Ottoman Turks captured Damascus in 1516, and it was part of the large and stable Ottoman Empire for just over 400 years, with the exception of 1832-1840 when Ibrahim Pasha of Egypt occupied it. World War I in Europe was paralleled by the Arab Revolt in the Middle East. The Ottoman Empire was on the side of the Central Powers, Germany and Austro-Hungary, and so the British and French supported the anti-Ottoman Arab forces. "The enemy of the ally of my enemy is my friend," in that day's analysis. That dangerous rationalization comes from the Arthashastra, a 4th century BC Sanskrit treatise on statecraft. In 1920 the French forces came in to set up the oddly named Mandate of Syria awarded them by the League of Nations. World War II was well underway in 1941 and the French government was controlled by the Vichy government. The situation was back to an outside emperial administration run by a government allied with, or in this case largely controlled by, Germany. So the Allies captured Damascus in June 1941. The modern state of Syria was established in 1946, with Damascus as its capital. Egypt and Syria briefly formed a union as the United Arab Republic for 1958 through 1961. 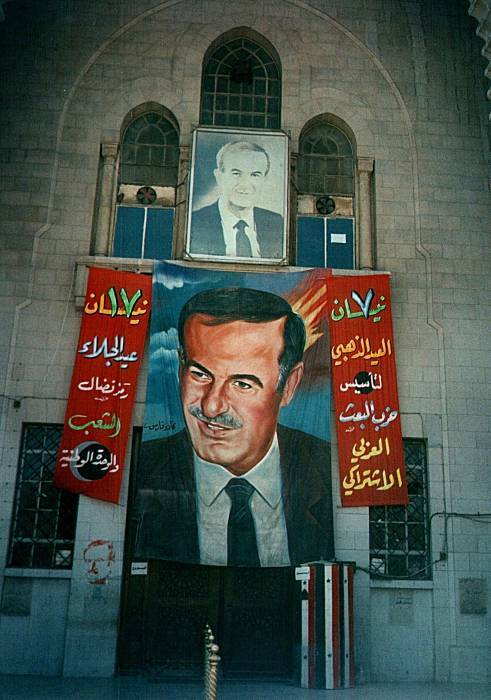 The Syrian Baath Party, rather different than the party of the same name in Saddam Hussein's Iraq, seized power after Syria's departure from the UAR. Hafez al-Assad was named head of the Air Force in 1964 and Minister of Defense in 1966. He then seized power in 1970 in a bloodless internal coup within the party, turning the national government into a family operation. Mark Twain has an amusing passage in his description of visiting Damascus in the late 1800s in "The Innocents Abroad" where he says that the writer Luke was an unappreciated master of ironic humor for referring to it as "The Street That is Called Straight" as opposed to simply "The Straight Street". The street called Straight is straighter than a corkscrew, but not as straight as a rainbow. St. Luke is careful not to commit himself; he does not say it is the street which is straight, but the "street which is called Straight." It is a fine piece of irony; it is the only facetious remark in the Bible, I believe. 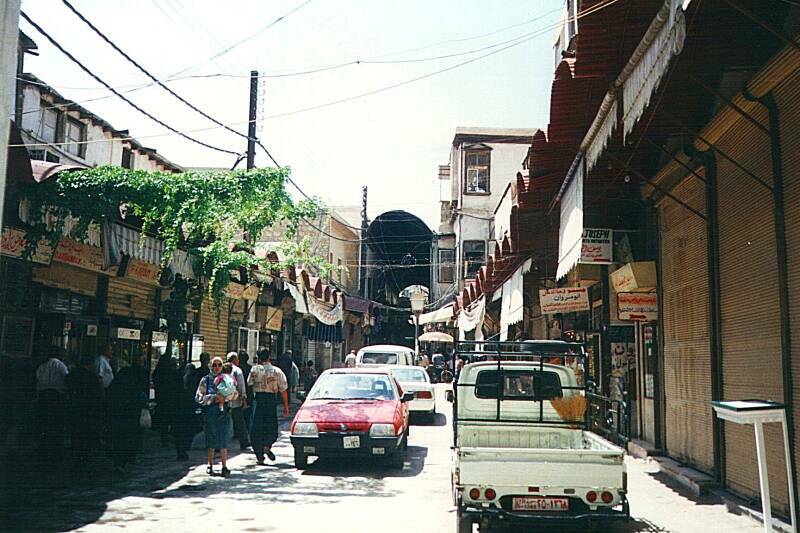 The Street Called Straight in one of its less crooked sections, just east of al-Hamidiyah Souq. 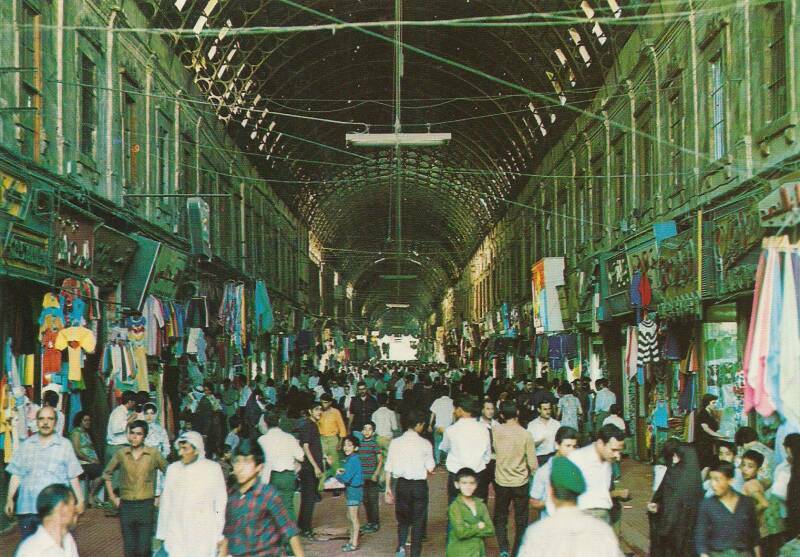 See the short covered section, one block as a covered bazaar. These are some short straight segments of The Street Called Straight. All the segments run more or less the same direction, from al-Hamidiyah Souq toward Bab Sharqi, the East Gate in the old city walls. It's just that the end of each one or two block segment is offset a little from the next one, and it takes advantage of the jog to the left or right to head off in a slightly different direction. You can see light through the arched metal cover in the distance, the street is roofed over as a bazaar for a block here and there. 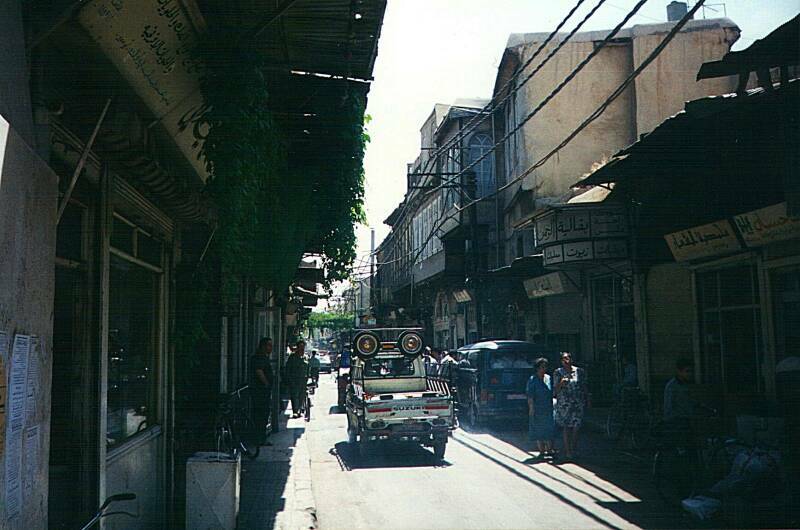 Continuing east, away from the covered bazaar and toward Bab Sharqi, the street opens up a little. You pass through a variety of neighborhoods. There are residences and all sorts of businesses. 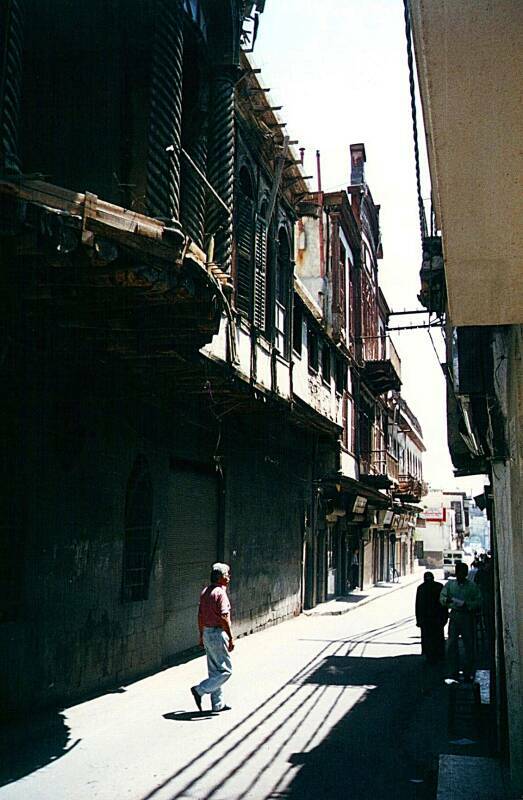 Old wooden houses hang over the street. Older, more ornate, and further overhanging. Bab Sharqi or the Eastern Gate. 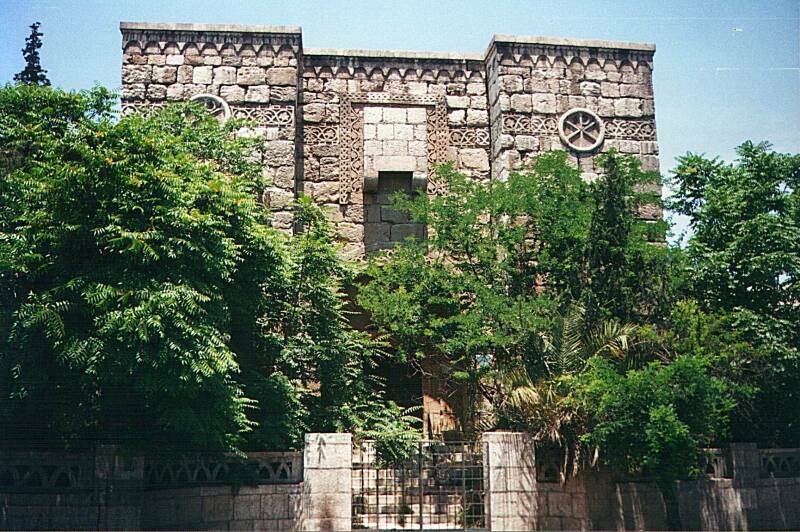 Bab Sharqi, or the Eastern Gate, is where The Street Called Straight reaches the old city wall. Pronounced "Bob Sharkey", this sounds like the old Damascus used-car salesman. In Damascus there was a disciple named Ananias. The Lord called to him in a vision, "Ananias!" "Yes, Lord," he answered. The Lord told him, "Go to the house of Judas on the street called Straight and ask for a man from Tarsus named Saul, for he is praying. In a vision he has seen a man named Ananias come and place his hands on him to restore his sight." "Lord," Ananias answered, "I have heard many reports about this man and all the harm he has done to your saints in Jerusalem. And he has come here with authority from the chief priests to arrest all who call on your name." But the Lord said to Ananias, "Go! This man is my chosen instrument to carry my name before the Gentiles and their kings and before the people of Israel. I will show him how much he must suffer for my name." Then Ananias went to the house and entered it. Placing his hands on Saul, he said, "Brother Saul, the Lord — Jesus, who appeared to you on the road as you were coming here — has sent me so that you may see again and be filled with the Holy Spirit." Immediately, something like scales fell from Saul's eyes, and he could see again. He got up and was baptized, and after taking some food, he regained his strength. 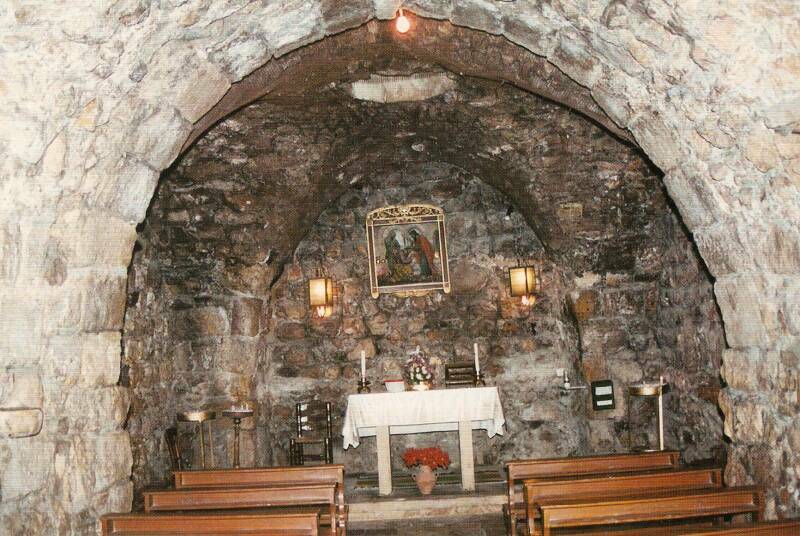 Here is the entrance to the Chapel of Ananias. It is not right on the Street Called Straight but on a nearby narrow lane running parallel to it. The entrance to the Chapel of Ananias. 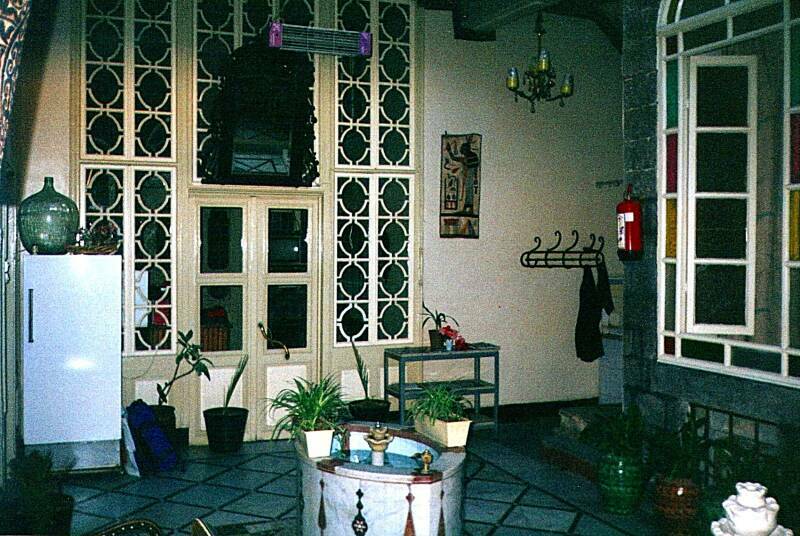 Interior of the Chapel of Ananias, a scan of a postcard. You go in through that gate into a courtyard, through a modern office area maintained by a religious order, and down a narrow flight of stairs into the basement. Into the basement? Did this Judas guy live in a basement? No, he lived in a city that has been densely populated for the intervening two thousand years. The average ground level has raised by six or seven meters through the buildup of trash and blown in dirt, so today's basements are previous ground-level homes and businesses. If you're looking to buy a carpet in Damascus, Babel's Shop on the Street Called Straight has a good selection. They made a sale — this carpet is now in my living room. From Beluchistan, wool-on-wool, woven around 1950-1955. 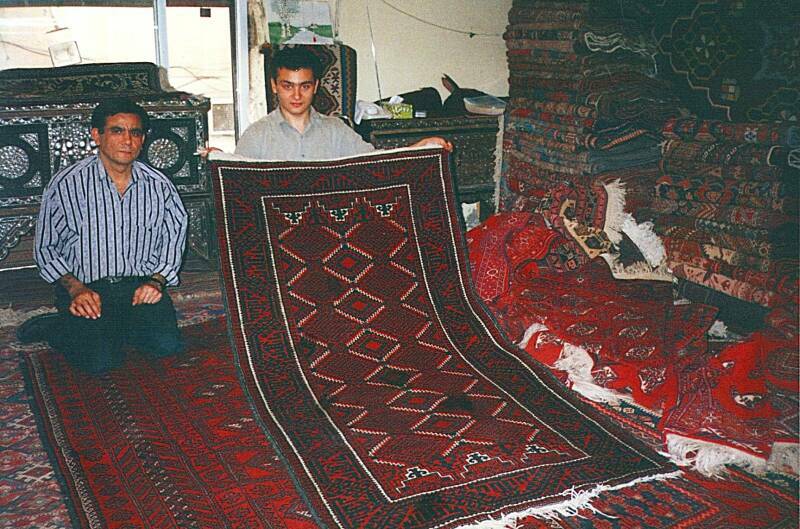 Anas at Babel's Shop, with what is soon to be my Beluchistan carpet. 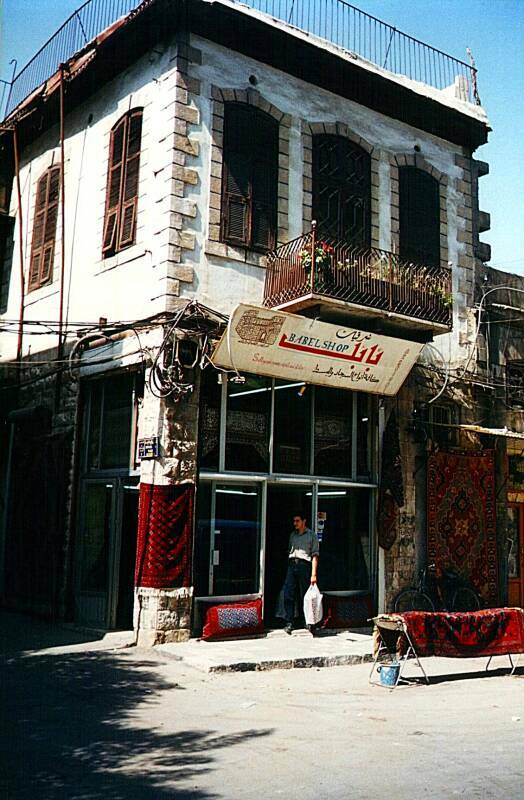 Exterior of Babel's Shop on the Street Called Straight near Bab Sharqi. If you seem genuinely interested in the street level showroom, they pull a hanging kilim aside to reveal a narrow staircase to the real showroom upstairs, behind those wooden shutters. How does a Damascus dealer come to have a decades-old carpet from the Iran - Pakistan - Afghanistan triple border region? Shi'a Islam, the predominant faith in Iran, emphasizes the hajj as one of the Five Pillars of Islam. But unlike in Sunni Islam, the Shi'ites venerate saints, positive examples, and often undertake pilgrimages to visit the tombs or birthplaces of especially holy figures. An Iranian family made a pilgrimage to Damascus, and brought along some of their carpets to sell while in Damascus to finance the trip. 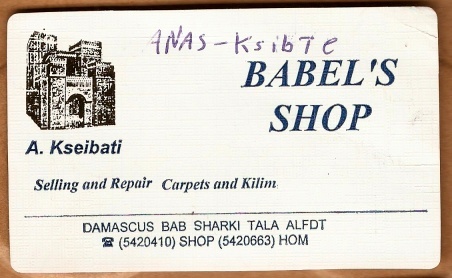 As for buying a carpet in Damascus... There will be lots of talking. Lots of little glasses of hot tea, brought upstairs by the uncle seen here. The initial price named will be quite high. Interesting, perhaps, in a purely academic sense, but of course far more than you would be able to pay, and you aren't really looking for a carpet anyway. Then further talk about where you're from, what it's like there, and now a round of cold Pepsi is brought upstairs. While the uncle was downstairs it was revealed that yes, the uncle sets the prices and they are rather high, but not absolute, and perhaps the carpet could be sold for as little as 80% of the initial offer. Well, maybe if I were to buy two at that price and sell one at a markup back home, but then I would have to haul two heavy carpets for quite a distance and I have no idea about the practicality of such a plan. Not really something I could count on being able to do. That led to an offer of about 70% of the initial price. That was still quite high, I said, although about 50% of the initial price might be reasonable, assuming that the minor dirty spots could be cleaned. Anas responded before long that 60% would be equitable, and I must know my carpets and my business. He then called to his uncle, who put the tea kettle on to boil and brought us some more Pepsi. We chatted for a while longer, then his uncle returned upstairs with the steaming tea kettle, a brass wire brush, and a clear plastic two-liter bottle that previously held Pepsi but now had a mostly clear greenish liquid, This was the carpet cleaning kit. You will notice in the above business card that they not only sell but clean and repair carpets and kilims, so this was no amateur operation. This was how the pros do it. We looked over the carpet for soil spots. Most looked like drops of dried mud, no wider than your fingertip. Anas would pour a little of the boiling hot water from the kettle, just enough to thoroughly wet the small spot, and then would brush it with the brass wire brush. A few spots did not respond to that treatment. The plastic bottle held Syrian gasoline. Anas carefully poured the cap full from the bottle, then transferred the contents of the cap to the carpet, working it with the wire brush as before. When the spot lifted, he repeated the hot water and brass brush treatment to float out the gasoline, and probably immediately evaporate most of it with the high temperature. This seemed rather harsh, but I hadn't paid yet so it was their problem if this ruined it. However, this harsh treatment worked just fine. These are serious working carpets, meant to last at least for decades, and more likely for centuries, so a little hot gasoline and wire bristles is no big deal. The cleaning was successful and I counted out the money. I had just enough currency left to complete the transaction plus a reserve until I got back to Turkey and bank machines. The paperwork, in the grand tradition of carpet paperwork everywhere, distored the actual price by claiming that I had only paid 40% of the original asking price, so I would have less trouble with customs. 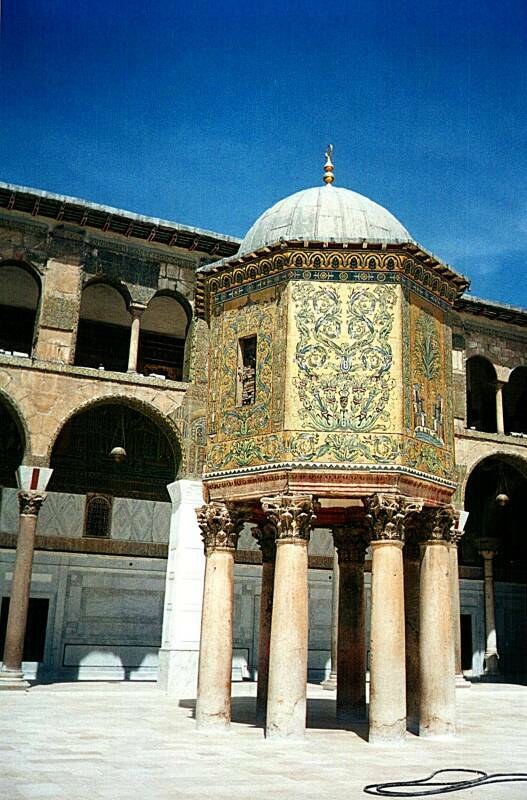 The Umayyad Mosque, the main mosque in central Damascus, is dedicated to John the Baptist. It houses what is believed to be his tomb (or at least the tomb for his head, after that run-in with Herod and Salome). And, the main mosque in Aleppo is dedicated to Ananias, the father of John the Baptist. All the holy men of Christianity are holy men to Islam, although it's a bit confusing when you first run into this. 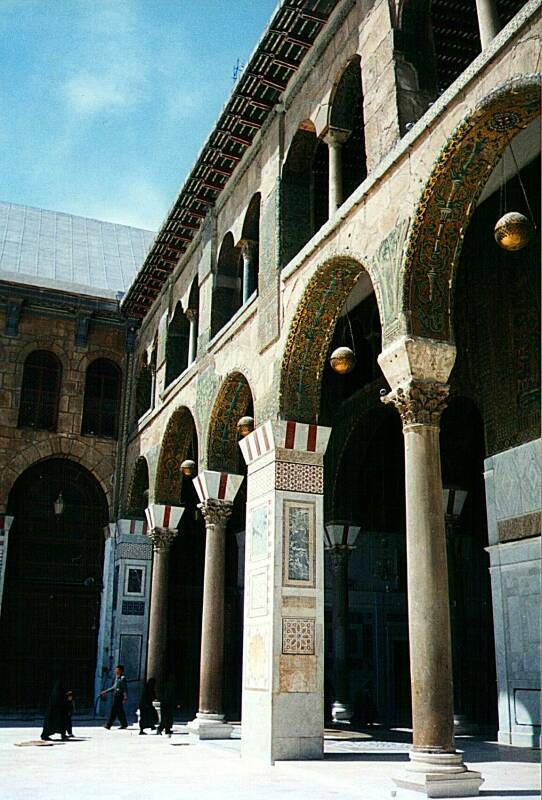 Courtyard of the Umayyad Mosque. 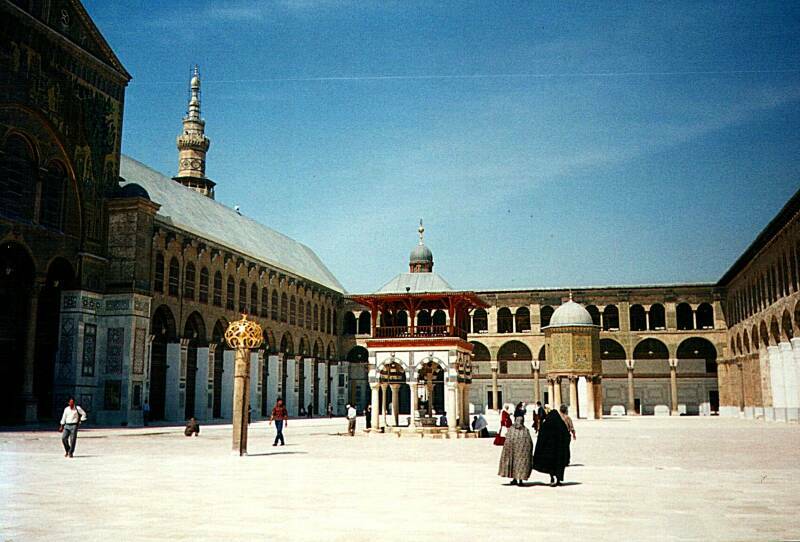 Courtyard of the Umayyad Mosque with the Isa Minere or Jesus Minaret at left. The Islamic belief is that Jesus will appear there on Judgement Day. Arched portico around the courtyard of the Umayyad Mosque. 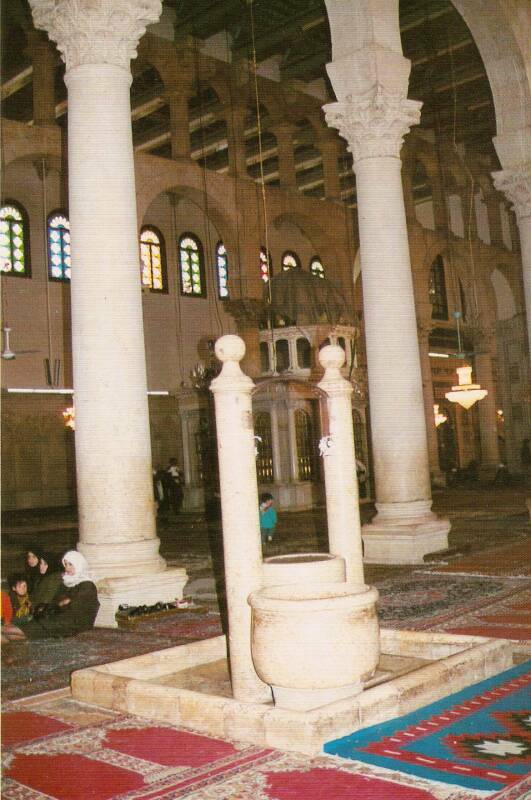 This postcard clearly shows some carpets and a fairly nondescript fountain inside the Umayyad Mosque. More interesting, but barely visible, is the shrine to John the Baptist, the small structure directly behind the two short white columns of the fountain. About 85% of Syrians are Muslims, and the remaining 15% are Christians. Most of the Syrian Muslims are Sunnis, while one-fifth of them (thus 17% of the population) are of minority Islamic sects like Shi'ite, Druze, and Alawite. The Shi'ites differ from the Sunnis as to which later successor to Mohammed was of the proper line — Mu'awiya (the Sunnis) or Ali (the Shi'ites). The Alawites are a small Shi'ite splinter group, believed by some harder line Sunnis to be heretics who worship Ali as a god. Assad and his cadre are of the Alawite minority. "Their distinctive faith has survived intact mainly because of the secrecy that surrounds it. Not only is conversion to or from the faith prohibited, but only an elite, known as 'uqqal (knowers), have full access to the religious doctrine, the hikmeh. The hikmeh is contained in seven holy books which exist only in hand-written copies. One of the codes it preaches is taqiyyeh (caution), under which a believer living among Christians, for example, can outwardly conform to Christian belief while still being a Druze at heart. They believe that God is too sacred to be called by name, is amorphous and will appear in other incarnations. Although the New Testament and the Koran are revered, they read their own scriptures at khalwas (meeting houses) on Thursday." 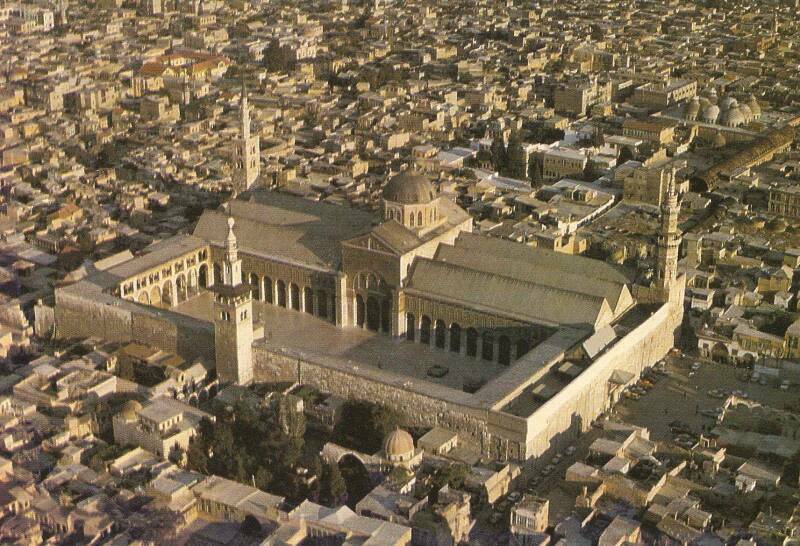 Postcard showing the Umayyad Mosque in the middle of the Old City. 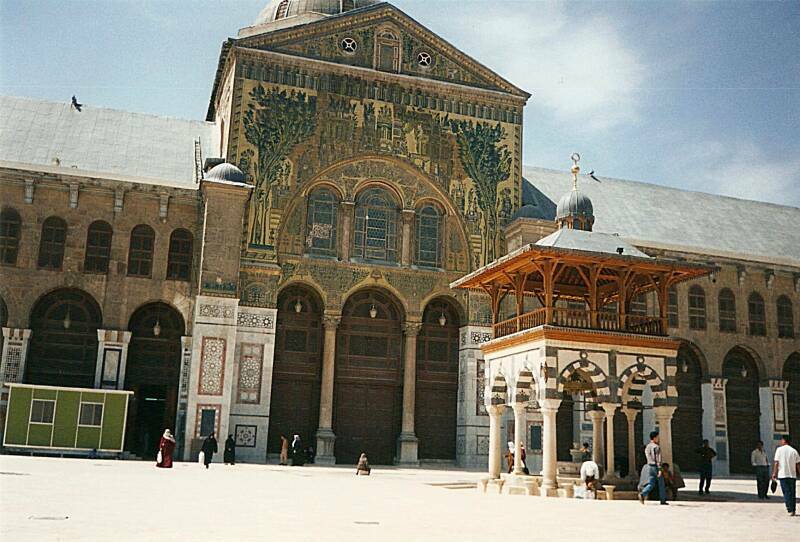 The Umayyad Mosque is also known for obvious reasons as the Grand Mosque of Damascus. It is one of the oldest sites of continuous prayer since the rise of Islam, but that's relatively recent in the location's religious background. The mosque was built out of an existing Christian church, which in turn was built on the foundation of a Roman temple, which in turn was built on, well, no one really knows how far back it goes. Remember that fact from the start of the page, how Damascus has been occupied since 10,000-8,000 BC. 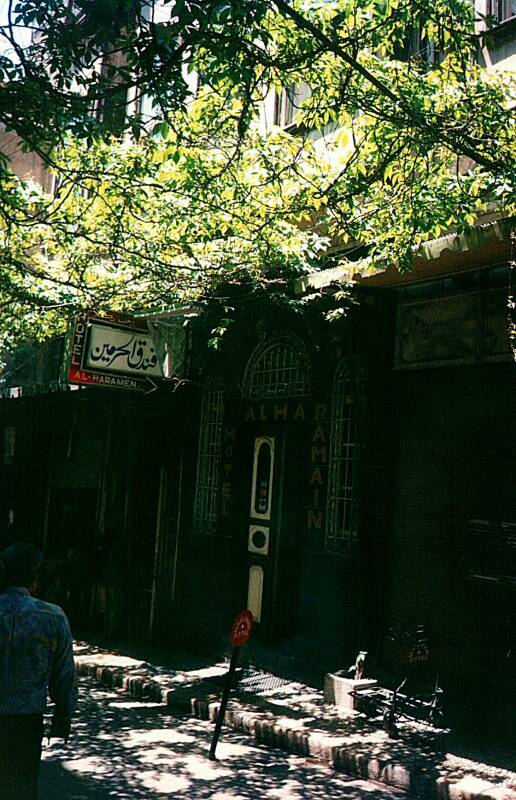 Damascus includes one of the greatest budget hotels ever — the Al Haramain Hotel, a leftover of French mandate days. 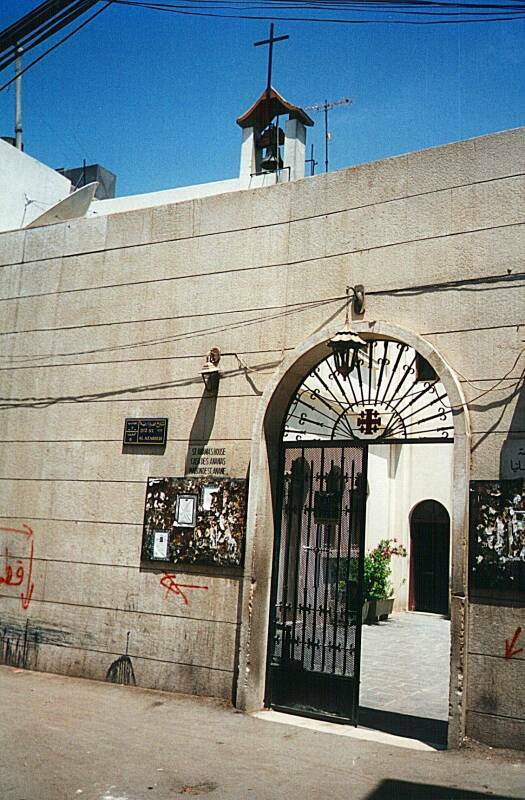 It's on Bahsa Street, a pedestrian-only street (it has a staircase! ), phone +963-11-321-94-89. Entrance to the Al Haramain from the vine-covered alleyway. Seating around the balcony on the second level around the open light well. From Martyrs' Square, or Ash Shuhada Square, go one block north to Choukri Kouwatli, running roughly east-west. 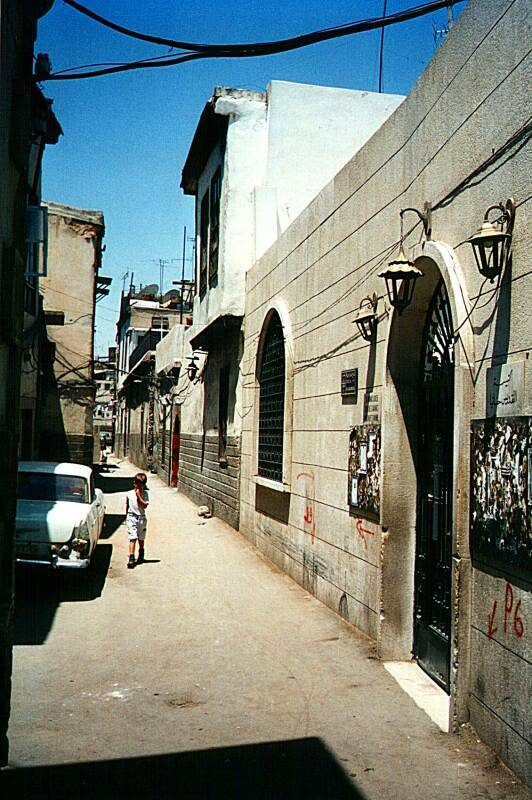 Choukri Kouwatli is also called Al Ittihad Street. 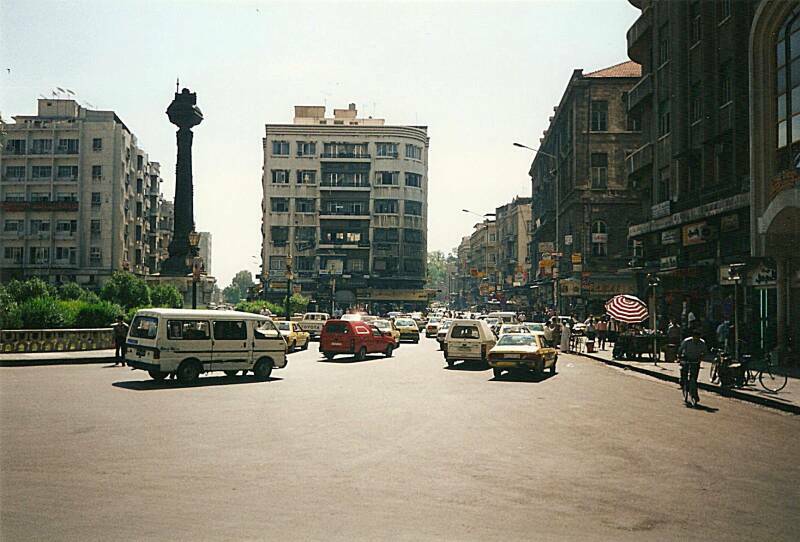 Cross to the north side of Choukri Kouwatli or Al Ittihad, and turn right. About a hundred meters down the street a small alley covered with a lattice of vines leads down a few steps to the left — that's Bahsa. The Al Haramain is about five doors ahead, on the left. If they're full, there is a similar place or two further along Bahsa. 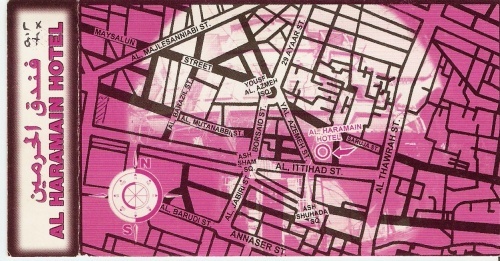 Map of central Damascus showing the Al Haramain. The Al Haramain business card. 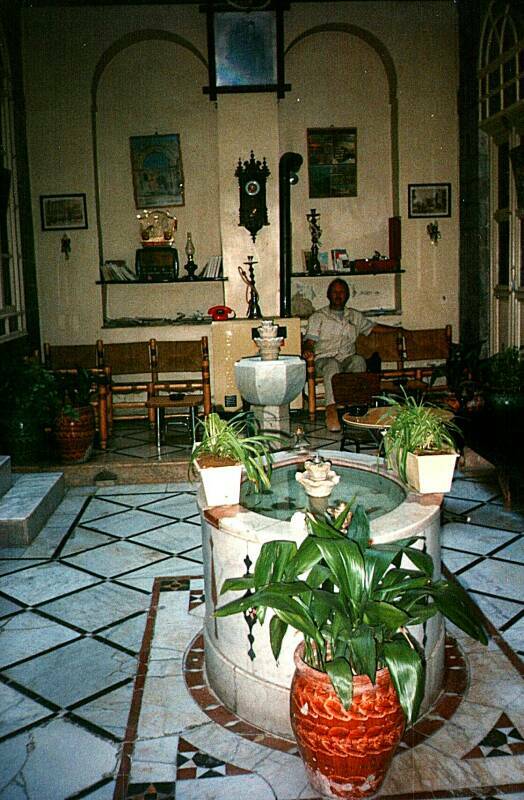 The Al Haramain has a courtyard with a marble fountain, leaded glass windows on the doors, and antique furniture in the rooms. The courtyard is open to the upper floors, and above them, to the sky. 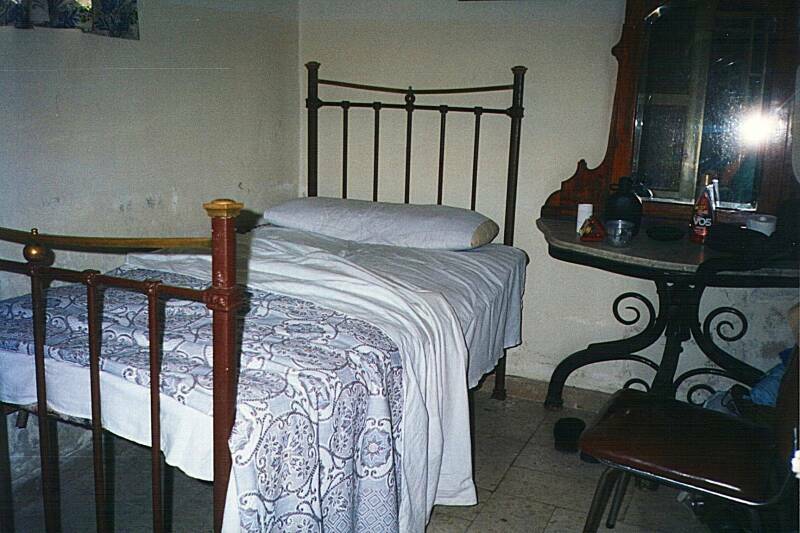 About 150 S£ (US$ 3 at black market rates) for a bed in a shared room, or 500 S£ for a double. Here I am, relaxing in the pleasant lobby. 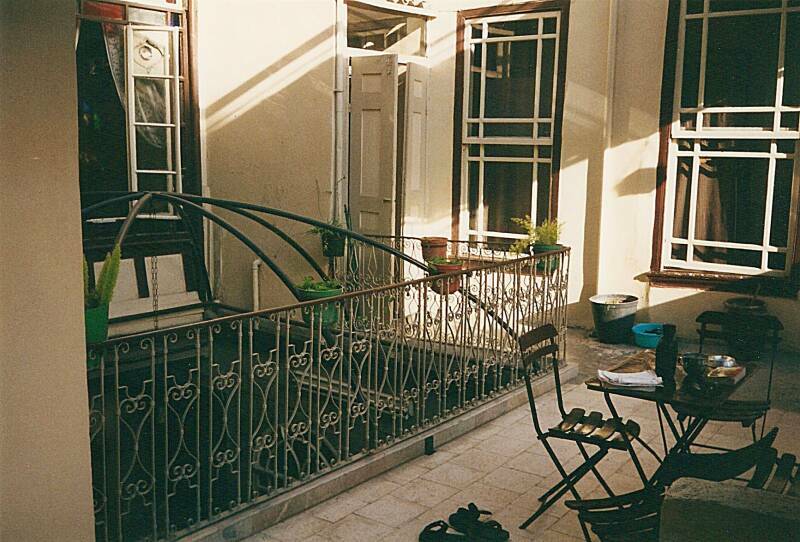 My room, just off the courtyard. Mark Twain has another relevant passage, this time in chapter 45 of The Innocents Abroad. The last twenty-four hours we stayed in Damascus I lay prostrate with a violent attack of cholera, or cholera morbus, and therefore had a good chance and a good excuse to lie there on that wide divan and take an honest rest. I had nothing to do but listen to the pattering of the fountains and take medicine and throw it up again. It was dangerous recreation, but it was pleasanter than traveling in Syria. I had plenty of snow from Mount Hermon, and as it would not stay on my stomach, there was nothing to interfere with my eating it — there was always room for more. I enjoyed myself very well. Syrian travel has its interesting features, like travel in any other part of the world, and yet to break your leg or have the cholera adds a welcome variety to it. Now, I don't think it was the cholera exactly, but I had a violent attack of something. It was probably from one of those many unwashed glasses in which the custom made fruit drinks are served. 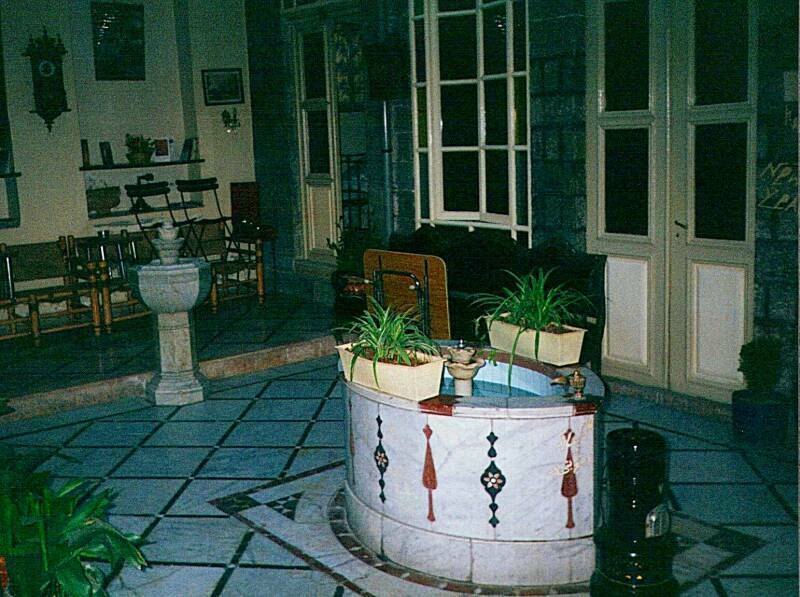 Anyway, as you see, just like Twain I had a pattering fountain to listen to and a wide divan on which to lie. The pattering fountain in the tiled courtyard. When I stayed there in 1997, I noticed that they had a collection of postcards sent from home by people who had stayed there. I sent them a card when I got home. I received a very nice card from them in October 2001. They had kept any envelopes in which they had received cards. After the al-Qaeda attacks on the U.S., they had sent letters of condolence and support to their former American guests — even ones who had last stayed there four years before. In their letter they first said that they hoped that none of my family or friends were harmed in the attacks. They then expressed shock and disgust over the attacks, and said that they hoped that the American public realized that the attacks were not an expression of true Islam. The second time I stayed there, the staff (largely one extended family) wanted me to meet a cousin who had not been there the first time. This was because he had been working as a contract laborer in Saudi Arabia. What he said really stuck with me — he was so glad to be home in Syria, where he had so much more freedom, and there was so much less oppression. That's right — compared to Saudi Arabia, he saw Syria as the land of freedom. Soon afterward, it was time to fly to İstanbul, and after a few days there, return home. On a second trip I spent less time, mostly just passing through on a trip overland from Cairo to İstanbul.